It was early August and monsoon was in full swing. The landscape was covered in lush green with a veil of thick mist descending from the mountains and dew drops formed on flowers as they bloomed. As the rain danced on the windshield, I hummed to soulful melodies by Jack Johnson en route to Prithvi’s Homestay in Madikeri. Feeling refreshed in dry clothes after a brief dance in the rain, I replenished my energy vault with a cup of local filter coffee and a plate of idlis (steamed rice cakes), courtesy of my kind hosts. Out of sheer curiosity about a river rafting experience down south—since it’s synonymous with northern India—this was the first thing on my agenda. So I packed my gear—a towel, change of clothes, floaters, shorts and a headband—and set out for Dubare, the starting point. The first thing you do before getting on the raft is sign a form taking full responsibility for your actions, but don’t be afraid. The only thing it states is that if you topple over the raft, bang into a rock or drown, it’s entirely your risk; see, nothing to worry about! It seemed straight out of a courtroom drama, where you swear on the holy Bhagwad Geeta that you shall speak the truth, and nothing but the truth. Well, an encouraging start eh? Luckily the adrenaline rush seeking adventure took over my wobbly thoughts and I headed towards the raft with two other people. 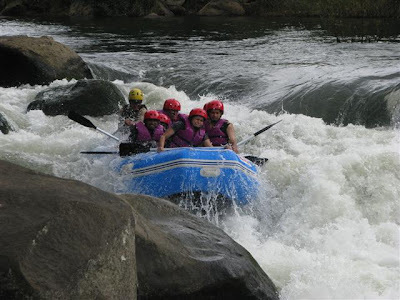 Once we were seated in our raft, our river scout imparted safety tips and guidelines to follow. And thus began my tryst with the Cauvery River. We all settled in our respective positions: me in the front with another person, and a middle-aged couple behind us. Our beginning was slow and serene. The tiny bit of fear inside me had completely vanished, now I thought, “It was so silly to worry; this is so simple, not like I’m in the water!” Just then, as if someone were reading my thoughts, our guide smirked, “You all need to take a dip in the water so that you get a feel of it.” And one by one, each of us were neck down in the freezing river. I must admit, it felt pretty good…of course, we had our life jackets on. The key to river rafting is balance. It’s a challenge to balance your body in an inflated raft on a turbulent river and manage to propel yourself further by rowing. So as we found our minds drifting away absorbed in the plethoric landscape, our guide brought us back to reality with his excited shriek, “Hold on!”, indicating an upcoming rapid. The first rapid rose three metres in the air engulfing our raft with chilling water as it descended. The thrill was so great that even the freezing cold water that splashed on our faces seemed invigorating. Suddenly, the excitement rushed through my body like a current. I couldn’t wait to experience the next rapid. Our arms were already tired and we were soaking wet and the sun was our only respite. As the river had simmered down, we tried to get our raft back on track after losing our direction whilst battling the rapid. The next rapid approached and got us back to our oars after a few minutes of rest. It proved to be higher and even more stimulating than before. Before the next mighty rapid a stopover for a steaming hot cup of Coorg’s local coffee was just the need of the hour. The two hours that we rode on the endless Cauvery was too little for me. I had never experienced an adventure like this before. At the end of our journey, the five of us on the raft had become rather friendly. So, while bidding each other goodbye, the kind middle-aged gentleman let out a little observation. Laughingly, he said, “When we sat in our raft, did you guys see the board that read: Beware of crocodiles?” Stunned, we all looked at each other, but within a few seconds we burst out laughing too. If he had blurted this out before we began, we would have probably missed the thrill of a lifetime! i am plannin a trip to coorg on aug 1 2009. but i am very confused about the place to stay. please tell me where u did rafting . how much did it cost u and how far was this place from madikeri. will monsoon have a negative effect on my trip or will it be good. an early reply would be highly appreciated. I deeply apologise for replying this late Deepak. There has been some problem with my gmail account and I did not get this message from you up till now. Pl do forgive! As for the answer. I would highly recommend you stay at Prithvi's homestay for the following reason: He will take care of everything!Apart from the fact that his homestay is very easy on the pocket, he also has a car he rents out to the residents of his homestay. He drives you around himself too. 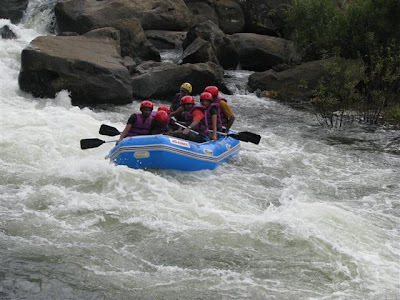 River rafting id done at Dubare, not too far from Madikeri, approx. 45 minutes or so. I apologise for not recalling the cost off hand, but it was within the ange of Rs. 500-1000. Monsoon is a benefit I would say.I went during monsoons and loved it. The place blooms during monsoon :)If you have any more questions, do let me know, I shall ensure i revert asap. All: I had a very bad experience with Mr Nanda of Nisarga tourism recently. He is not a person who keeps his word. I will blog more about the details but for those who want to choose to go with Mr Nanda, please check the place he gives you before you pay your money. More details coming up later. Coorg is certainly a nice place to visit. However if you really have to enjoy the place please make sure you make the right arrangements for Stay & Travel. I paid Rs 36,000/- for stay & travel. I was told that I will be given a 5 bedroom house as we were 16 of us. Nisarga Tourism cheated us by giving us only a 3 bedroom house where we had to stay with so much discomfort. To add to it, we were being taken in the van for 2 to 3 hours in the guise of finding a better house. This house searching happened also at night on the 3'rd day. Imagine with old people and children how we would have felt alone in the dark woods stopping here and there for a house and this fellow called Nanda from Nisarga Tourism is only on the phone directing the van driver. The advance amount was promptly plucked from us on the day of arrival. Had I known that Nisarga Tourism Mr Nanda was a man of no Ethics, I would not have paid the entire amount on day 1 itself. We did visit places and the children liked Coorg very much. However I think one should never go for homestay at coorg unless you are absolutely sure about the place & have some confirmation number etc so that you can press legal charges if there are flaws. The last day we stayed at a place which is owned by Mr Prasad and he advised us that people like Nanda are brokers and are only concerned in making money so dont trust that fellow. We then got his visiting card and said next time we will contact you directly. Bottomline of the story, if you want to visit coorg, dont trust brokers like Mr Nanda and dont go to Nisarga Tourism. Instead stay in a hotel or at least if it is a homestay, then contact the owner directly. I hope I am able to prevent some one else getting frustrated like me. Again its only the ethics of Nanda & Nisarga tourism that frustrates me. Coorg is a nice place - Dubare, Cauvery, Abbey, Iruppu , Raja seat are the pleasant memories that help me see beyond Nisarga Tourism & Nanda. I'm very glad that you shared your experience Isaac. I was probably one of the lucky ones to have an amazing experience in Coorg at the Prithvi Homestay. But of course, everyone doesn't face the same. I hope others don't have a regrettable experience as yours and I thank you for spreading the awareness. I'm sorry. But there is much more to Coorg than this. There is boar hunting. Awesome pork meat.Coorgie weddings, coorgi dance and the alcohol culture, the coorgi tradition of being warriors.